In a kadai put the oil and fry asafetida, dhals and red chillies. Add tamarind and fry for a while. Then add curry leaves and keep the stove to minimum. Fry the curry leaves for few seconds. Add coconut and switch off the stove. Cool it. Add salt and grind to a paste. This chutney is an all time favourite. Looks yummy. Im glad to see your post in taste of india..now more of us can benefit from your site..
Chutney looks perfect. 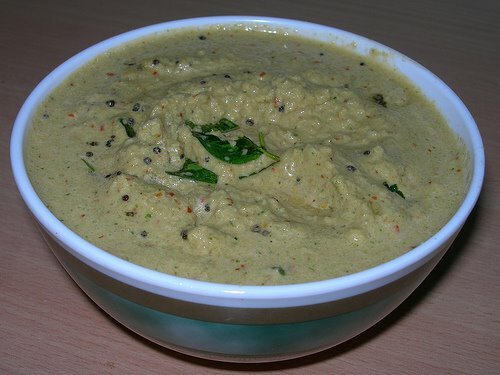 It is a great dip for dosa and idly. Thank you all for visiting my site and posting your comments. Anu – Yes. It tastes like dhal chutney but with the goodness of curry leaves. Never made this before. Would love to try. Thank you for visiting my site. Try this chutney and post your comments. I tried this chutney,it was a super match for Idly and Dosai!! 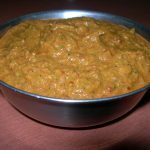 Never tried chutney in this style… Looks interesting; will surely try this tomorrow.